There’s usually no rhyme or reason for how I decide which of my grandmother’s hundreds of recipes to make. This creamy cool soup happened to sound particularly appealing on a recent day when the temperature climbed to almost 80 and my mind went into summer mode, no matter how hard I tried to reason with it. Summer mode for me usually means consuming a ridiculous amount of ice cream (some of which I can blame on my regular full time job) and pulling out my ice cream maker to tackle some absurdly unhealthy recipe that usually includes chocolate and a combo of too many things that taste good with it. Since it is still too early for summer mode, I managed to convince myself to make something healthier yet equally rich and satisfying. This cold soup does the trick. The base of this recipe comes from the stack of unpublished Paula Peck recipes I inherited and cherish. These faded typewriter written recipes with handwritten edits, are always the most fun for me to test because the recipes are rough and yet to be finalized. Some, like this avocado soup recipe, have a couple of different versions with varying measurements and instructions. One of these came with a note that said “This is a truly delicious summer soup. 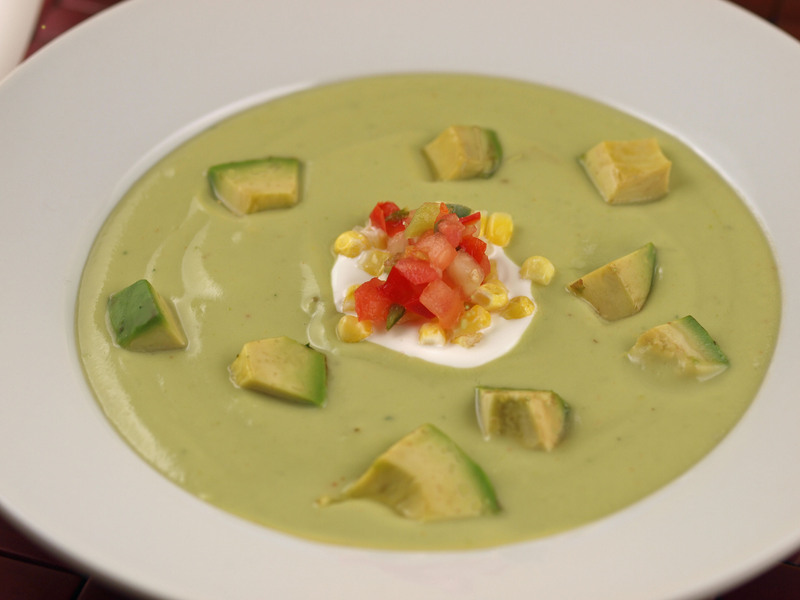 My friend Togi told me about it after she tasted it in Mexico.” I find it pretty impressive (and progressive) that my grandmother was making cold avocado soup in the late 1960’s when avocados were still considered somewhat exotic – and not found at every deli or sidewalk produce vendor in NYC like they are today. It’s a very simple recipe and I made only a few minor adjustments like adding scallion, cumin, lemon juice, cayenne, and the garnish of sour cream, corn, and salsa or chopped tomato. In a heavy pot, melt butter. Stir in flour with a wooden spoon. Cook, constantly stirring, for about 5 minutes (do not brown). Stir in stock. Bring to a boil and then lower to a simmer. Cook just until mixture begins to thicken. Remove from heat and cool. Place 3 1/2 – 4 cups avocado and scallion in a blender. Add about 1 cup of the stock mixture. Blend until smooth. Add avocado mixture to remaining stock mixture. Stir well. Season with salt and pepper. Add half and half. Chill. 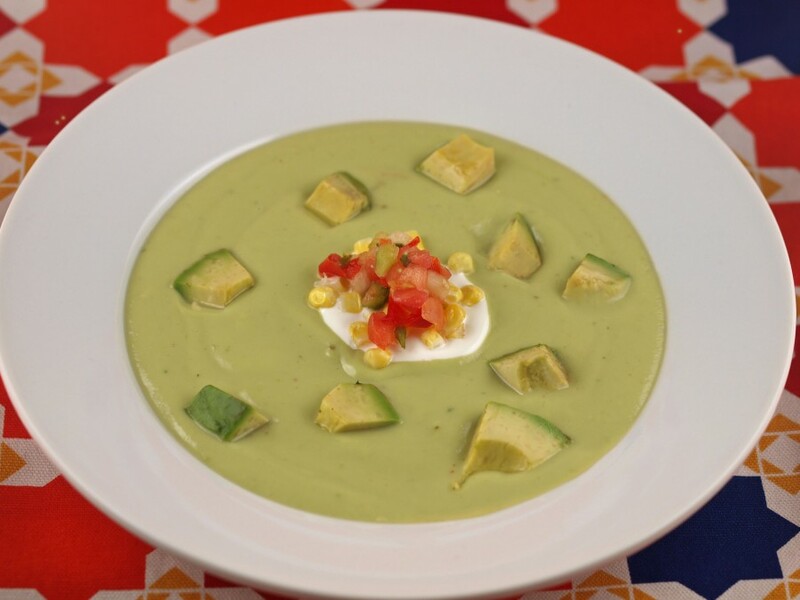 To serve: pour into bowls and garnish with remaining avocado cubes, sour cream, corn, and salsa (if using). Nice recipe! We grow avocados on our family farm in southern California. Every day we share special avocado recipes on our Facebook page for California Avocados Direct, our farm subscription service. Today we shared a link to your post! Thank you! Thanks so much mimi!. I love southern California and avocados. I’m now following you guys on facebook. Thanks again!